Quick Tidy Up Needed? 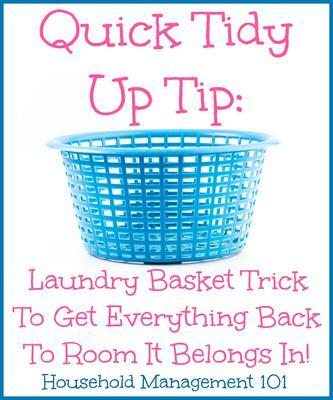 Use This Laundry Basket Trick! It never seems to fail. Just about everyone living in the house seems to leave items out, not putting them back into the room they're supposed to be in. 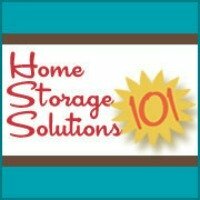 This can quickly lead to a mess, especially as more and more items are out of their place. That's why a routine tidy up in your home can be so helpful. It puts all the items back in their place periodically to keep the chaos at bay. So I thought this tip from a reader, Karen H., from Chatham Ontario was just great. 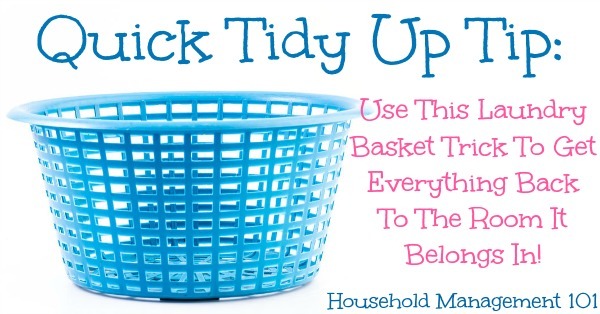 She uses a laundry basket each morning to help her put everything back in its place. Each morning I take a laundry basket (or a box) and move from room to room, putting everything in the basket that does NOT belong in that particular room. As I move to each room I add to the basket, or take out from the basket. If you go around twice, everything should find its place in the right room. For example, if a towel, a pair of shoes, and a dish, are in the living room, it gets put in my basket. When I move to the kitchen, the dish goes in the dishwasher. In the kitchen I might find a book and some toys. They go into my basket. When in the bathroom, I hang the towel on the rack, and the shoes get put in the hall closet. The book goes on the book shelf, and toys go in the family room.. . When the kids were little I set the basket in the living room and they would go from room to room "finding" things that didn't belong. And then they would help deliver things out of the basket. When it was all done, they got a treat. What a great idea! I love both the simplicity of the system, and that she made it a routine by doing it daily so it really wasn't overwhelming but instead just took a few minutes of her day! So do you have any tips for doing some quick tidy ups in your home, especially as part of your daily routine? I'd love to hear below, in the comments.